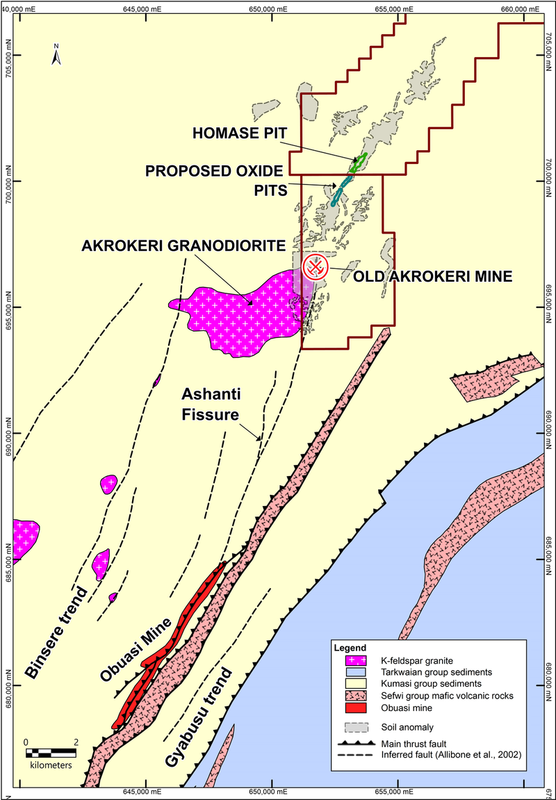 GoldStone holds a 100% interest in the Akrokeri Licence. 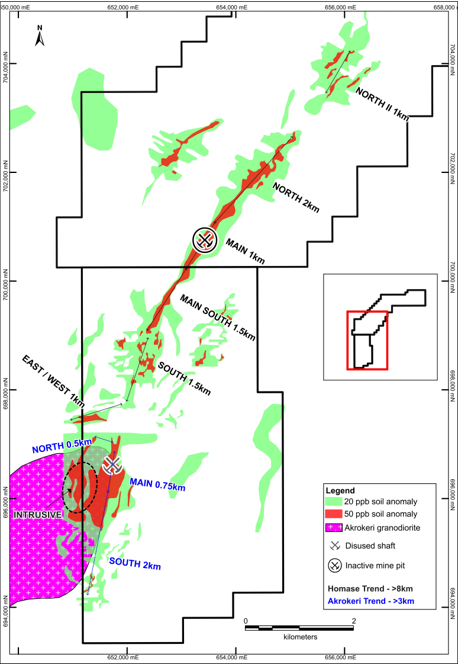 The Licence is located approximately 6 km along strike from AngloGold Ashanti’s Obuasi Mine, which has a total historical and current resource in excess of 70M oz Au. 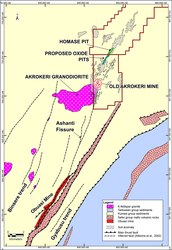 The Akrokeri Licence is home to the Akrokeri Mine, which historically produced 75,000 ounces of gold at a final recovered average grade of 0.73oz/t, equivalent to approximately 24 g/t. 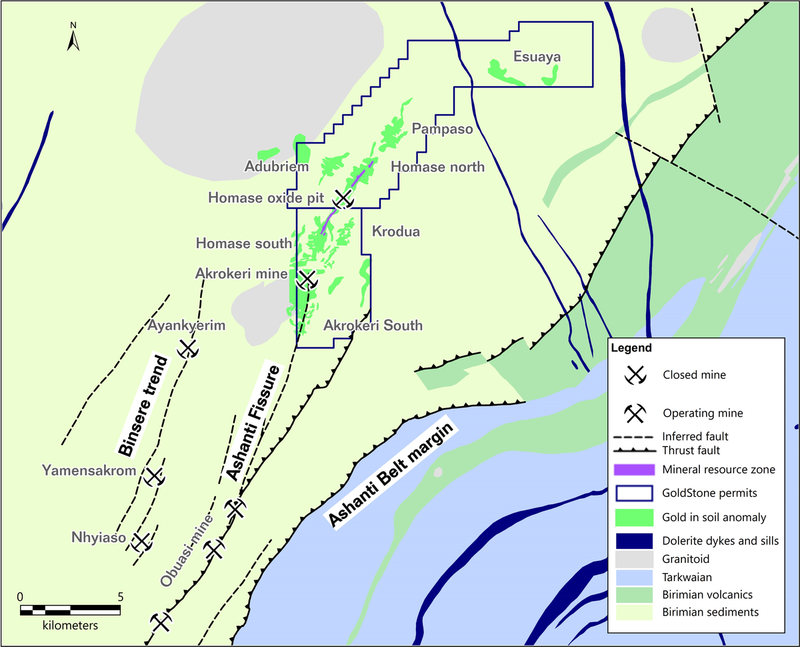 Recent work by GoldStone has identified high grade quartz veins of up to 51.2g/t Au. 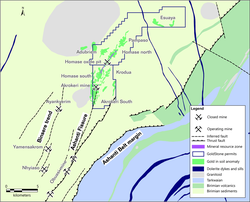 The Akrokeri Mine was closed in 1909 following an ingress of water meaning that a mine clean-up was, in all likelihood, never executed. On that basis and assuming the gold recovery from previous workings was not 100%, the Board believe that the mined head grade at the mine could have been greater than 24g/t Au. 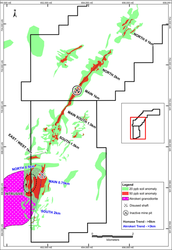 The new ‘Norton’ shaft is being sunk 40 metres east of the historic North Shaft at the Akrokeri Mine to a target depth of 30 metres in order to access to the mineralised zone at the Mine, as well as access the old mine workings, which were fully operational until its closure in 1909.